I’ll admit it; I don’t like the works of Shakespeare. I was spoon fed them at school a lot with plays such as Macbeth, Twelfth Night and A Midsummer Night’s Dream. On one occasion we had to dress up as a certain character from A Midsummer Nights Dream (either Puck or Bottom for boys) and act out one of their scenes. I chose bottom and had donkey ears attached to my glasses at the time. I remember watching a film version of Twelfth Night (which I enjoyed to a point) and couldn’t find reason in what certain characters say; like a woman pretending to be a man and saying something like “If I were a woman, I’d marry you”; or another case of a bloke agreeing to marry someone he’s only just met after washing ashore on the island. In recent history, particularly at University I did some of Romeo and Juliet. Once in Foundation, and more recently in second year when we looked up different adaptations of the story; including the Baz Luhrmann Film (which on occasion has inspired me) and an excellent Dire Straits song. So while I do have the odd moment where I like the adaptations of Shakespeare, I just don’t like the original works. So I can be glad then that Throne of Blood is an adaptation. Released in 1957 and Directed by Akira Kurosawa, Throne of Blood is an adaptation of Macbeth. Now this is not the first time that I have watched one of Kurosawa’s adaptations of a Shakespeare play. Back in late 2012 I watched (and reviewed) the rather brilliant film RAN which is based on King Lear. Since watching Seven Samurai in 2012 I have been collecting films by Kurosawa every now and again. One of the films I most wanted to see was Throne of Blood. So last week, while everyone else was out watching the 97th Lord of the Rings film, I decided to use the opportunity to watch Throne of Blood. A chorus of singers sing about Cobweb Castle, a fort that once in a now desolate land; all that now remains is a stone plinth used as a memorial. Fog covers the land and the Castle appears. Lord Tsuzuki (Takamaru Sasaki) rules there and his outer forts come under siege from a traitor. His armies fight back however. In Cobweb forest, Commanders Washizu (Toshiro Mifune) and Miki (Minoru Chiaki) are on their way to see Tsuzuki. While in the forest however they hear loud shouting before encountering a spirit (Chieko Naniwa) in a little hut. The spirit tells Washizu that today he will become head of North Mansion, and then head of Cobweb Castle. Miki meanwhile, today will become head of Fort One (Washizu’s former post), and that his son will eventually become head of Cobweb Castle. Initially they don’t believe her and on their way to the castle they stop for a break. When reaching the castle they are rewarded like the spirit told them they would be. With Washizu now in charge at North Mansion, he looks forward to a life of peace and is currently happy with his due. His wife Lady Asaji (Isuzu Yamada) meanwhile likes what the spirit has said and begins to manipulate Washizu. When Tsuzuki visits North Mansion, Asaji drugs the guards protecting Tsuzuki while he sleeps, and Washizu murders him. Upon returning in shock at what he has done, Asaji places the spear in one of the guard’s hands and calls Murder. Washizu then kills the guard. Tsuzuki’s son; Kunimaru (Hiroshi Tachikawa) meanwhile believes that Washizu murdered his father and along with Noriyasu (Takashi Shimura), a loyal commander to Tsuzuki try to warn Miki about Washizu. Miki however does not believe Washizu would do such a thing. Washizu is made Lord of Cobweb Castle plans to allow Miki’s son Yoshiteru (Akira Kubo) to become the next lord at Cobweb Castle, but Asaji is now Pregnant, meaning Washizu will need to eliminate Miki. At a banquet, Washizu gets drunk and begins to have hallucinations when he sees Miki’s ghost. He begins to shout and act out and unknowing reveals his betrayal. Asaji tries to pick up the pieces asking for the guests to leave. A guard then arrives with Miki’s head but says his son escaped. Asaji miscarried her baby, and a distraught Washizu heads into the forest to find the spirit again. The spirit tells him that he will not lose a battle until Cobweb Castle moves. Thinking such a thing is impossible, Washizu is confident that he is invincible. Noriyasu’s men begin to approach Cobweb Castle. Washizu spirits the men on by telling him what the spirit told him. They all believe him and share his confidence. During the night, the men at the castle begin hearing strange noises, and then a whole flock of birds suddenly fly into the castle. Everyone thinks it’s a bad omen. Washizu though checks on his wife who has gone catatonic and tries to wash off non-existent blood off her hands. Washizu then hears soldiers running around and sees his soldiers fleeing from their posts. They say that the forest is moving. Washizu goes to have a look and sees to his horror that the forest is indeed moving. The army of Noriyasu is using the branches as cover. Washizu’s men then turn on him, and begin to shoot their arrows at him. He tries as hard as he can to dodge them, but to no luck and eventually gets shot through the neck and dies. The scene then changes back to the desolate landscape and back to the memorial. While it may have been an idea, to look and see how this film compares to Macbeth, I didn’t do any look back/research before writing this. From what I know however, I can see similarities to Macbeth. Washizu is Macbeth, the forest moving and the character of Lady Asaji is Lady Macbeth while Miki is Banquo, (however it was my dad who pointed that out to me). The spirit in the forest is the strange women from Macbeth and the story is basically the same as Macbeth rising to power. The film though as when I look at it, not as in looking for similarities, but as its own standing, is quite interesting. The film tells a story of a man, a great soldier and a loyal commander, who is driven to insanity through the manipulation driven by his wife and later the desire to keep hold of his kingdom. The decent of this man continues as those trustworthy around him begin to split from him which eventually leads to his demise. The part of this character is played brilliantly by the great Toshiro Mifune. This is not the first time I have seen Mifune in action, and since watching Seven Samurai have seen him as my Favourite actor. He is easily the best person for the role of Washizu as his commanding and domineering presence on-screen is well done. But he can also get mad and in Throne of Blood though we see how a person descends into madness. First through regret of actions, through to desire, lust and then insanity. To begin with he is a very respectful man, he is the epitome of a protagonist, but by the end he is very much the Antagonist, and while the story to continues to revolve around him as the central character, he is now the villain and gets what’s coming to him. In the same league we have the character of Lady Asaji who from the moment you see her, you can tell she is not very nice. Much like Lady Kaede in RAN, she is a schemer. She has begun plans to make sure the spirits visions come true and begins the manipulation required to get Washizu to do what she wants. She wants these things for him as much as her, but likes the idea of being in control and wants her family to remain on the throne. From early on, she is a key figure and remains so until just before and a little bit after she miscarried. From the onset though, you have no sympathy for her. In an opposite fashion though there is commander Miki. He is a very likeable person and appears to be a true friend to Washizu and remains loyal to him until the end. While he does not understand the visions of the spirit, he just goes along with it until they become real. Miki from start to finish is a character you do care about as he has a very nice on-screen presence and is in no way ruthless, but it does become predictable what’s going to become of him. I do feel like it is rather surprising though that Takashi Shimura does not get more of a prominent role. In the past particularly if you take films like in Ikiru, Rashomon and Seven Samurai, Shimura has had more prominent leading roles, but while he gets a good amount of screen time, I think it’s rather surprising that he doesn’t get more. While he is noticed at the beginning at the council, and then rides in at the end to bring down Washizu, it just feels like for most of it that he simply disappears. Other characters in the film such as Yoshiteru and Kunimaru don’t really have much of a part to talk about though, for the most part it’s not down to them to save the day, and it rests more on the shoulders of Noriyasu to save the day. On occasion there are other cast members of note, such as the lamp bearers and the guards that stand out, but really it feels like something of a let down from some of the supporting characters in terms of the story anyway. I do like the character of the Spirit. It’s quite an uncomfortable character when she is on-screen, but that’s probably what was meant to be. When she is laughing and cackling in the forest and you can hear that, it’s almost disturbing and scary. But when she is on her own in the hut spinning the wheel you think for a moment that she might be someone else, but then discover more. Alongside that you also have Lord Tsuzuki who for his brief time on-screen is very enjoyable, particularly at his counsel during the first few moments of the film. The film has a terrific setting. Filmed on the slopes of Mount Fuji, the desolate landscape allowed the use of fog which is used to great extent as it allows moments of lost and confusion while also giving moments of reveal too. When Washizu and Miki first see the castle and it is slowly revealed in the background while they talk as well as when they are lost in the fog is a great scene. The first moments too allow a reveal of the shrine/memorial to the castle and are used to the effect of showing what remains as well as the chaos caused from the events, even if they haven’t happened yet; add to that the scene of the forest moving shows a real sense of mystic energy as it makes the tree look like they are actual beings and not just men using them. Other uses of weather such as rain and thunderstorms are put to good use when used in Cobweb Forest when people are running around and when the Spirit laughs in the early moments of the film. The area of North Mansion as well as the mansion itself is actually very beautiful and shows an element of peace just in its look. Effects aren’t just limited to weather though. The ending scene with Washizu being shot at with Arrows; the arrows are real. Mifune wanted the use of real arrows (choreographed) to be shot at him to give a real sense of terror in his actions. Now while I am as of yet unsure about the one through his neck, the effect works brilliantly and is one the film’s best moments. When it comes to the film’s soundtrack, it’s hard to say much about it as I don’t remember many scenes where it is used. The singing at the beginning is apparent, as too is the arrival of Tsuzuki at North Mansion, but the film for me anyway appears to use mostly sounds and not much in the way of actual music. The films theme though is pretty good. While it may not be as grand in its element with other Masaru Sato pieces, particularly later ones like Yojimbo and The Hidden Fortress. The theme however has the mystery/mystic element about it before it eventually feeds into the singing but while it is certainly different, and that is the best way to describe it, it’s also very enjoyable from start to finish, even if you only here the first few seconds. The film does struggle when it comes to pacing though. The early moment of singing, through to the Lord’s counsel of the attacks and then to the scenes from the forest to the attaining of North Mansion are very enjoyable and stand out as moments I really enjoyed. However I think the story of the film begins to get stagnant from then on. There was a long pause from when Washizu and Miki first meet the spirit, and then things really do slowdown from North Mansion onwards. The film picks up at moments though, with scenes like the horse ride chase, and scenes leading up to the banquet. But then they begin to stagnate again with points of me wondering how long the film had left (or that may have been me getting a little tired) and only picking up again as the film drew closer to finishing. For most of the film, there are some really good points and the pacing remains equal, but some scenes have long pauses and gaps where almost nothing happens for a while and this sets it off. While those moments may want to show elements of peace in the chaos, when they’re too long, you begin to notice it. Throne of Blood does have its issues, from certain moments of lack of cast and pacing, but throughout I did enjoy it. While I don’t think it stands out from other Akira Kurosawa productions such as Seven Samurai, Hidden Fortress or RAN, I did enjoy this, even if it is based on a piece of work by Shakespeare. It features another great performance from the terrific Toshiro Mifune as well Minoru Chiaki. While it is in fact an adaptation of a play several hundreds of years old, I think it also stands out on its own two feet as something which can be enjoyed by itself (the adaptation point does allow for some clarification if it gets a little confusing). With scenes of action intermixed with scenes of drama and great weather effects; Throne of Blood is definitely worth a watch and while it may appeal more to people who prefer drama over action, there is still something for everyone, even if the title is somewhat off-putting. During the early 2000’s, Lego released a toy like no other that it had produced at the time. The Toy was story based and revolved around certain characters and the adventures they went on. The toy was more like a set of constructible action figures than construction based sets and used a new form of construction too. Next to that, the toy was also a far cry to Lego’s previous creations as it was against their passive beliefs from when the company first started. This new toy was very experimental and originally released under the Lego Technic brand before going out on its own and as a result became one of Lego’s biggest and best-selling franchises spinning off into other forms of media and merchandise including Video Games and a Movie (way before the 2014 film) and as a result was the kick-start Lego needed to get out of the financial troubles they suffered in the 1990’s. While this toy has since stopped being produced and replaced, recent news has given me cause for excitement with the announcement that Bionicle is making a comeback. Back in the early 2000’s, for me, Lego was still something I enjoyed, but something I didn’t play with all that much, and the only Lego I really used was my brothers old Lego Bricks from a couple of boxes in my room. Then I spotted Bionicle, and I was interested. I liked the fantasy look about it, the almost superhero like element about it, and that it looked a lot like Lego Technic. Lego Technic was a more grown up variety (at least to me) of Lego but the kits and sets were really expensive, and I didn’t have enough pocket money at the time to afford them. Lego Bionicle though really did interest me, and I kept my eyes on it. 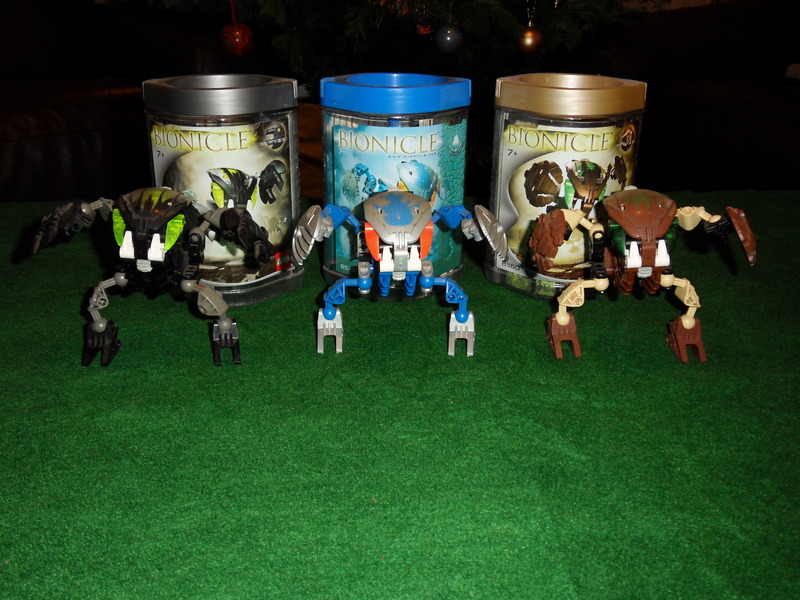 Eventually, round about the time of the release of the Bohrok sets, I began to get them. The Bohrok were the first things I got. These alien like, bi-pedal bugs with vicious looking teeth came in these cylindrical jars, like containment tubes. The idea was, you could construct them, then hang them in the jars. 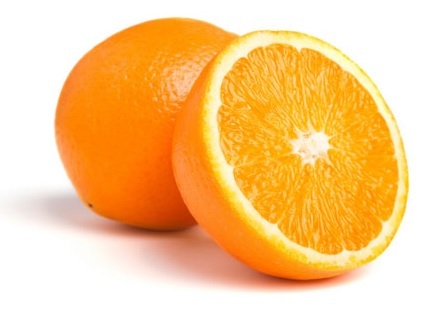 They could both stand on two legs, but the design meant they could be rolled up into balls too. The sets also had motion too where you would push down on a little lever at the nape of the neck and it would make the heads jump out forward. 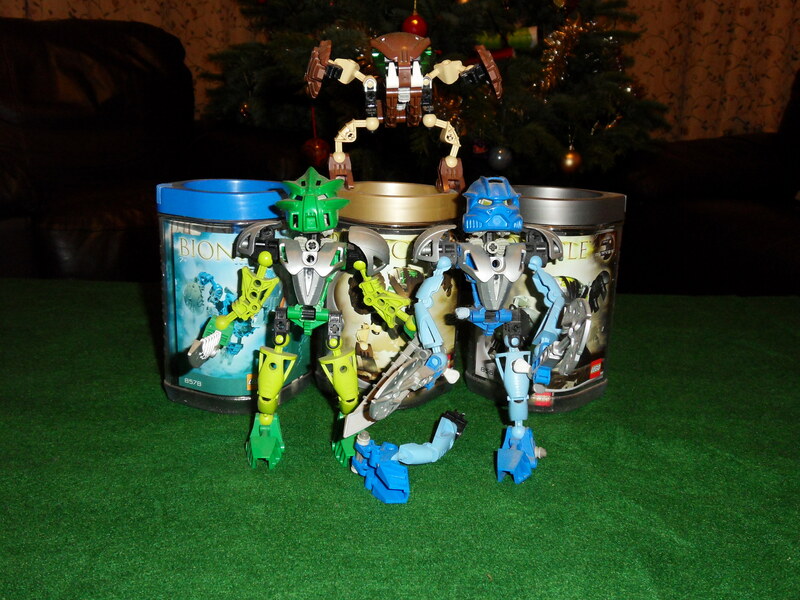 In the end I collected three Bohrok sets; a black one (NUHVOK) a brown one (PAHRAK) and a more especially themed blue one (GAHLOK-KAL). One of the things that made Bionicle stand out was that he sets of figures such as the Bohrok could be combined together to make bigger models. I however, didn’t collect the right sets to make a big one. I only collected three Bohrok, The brown and the black one does combine together, but the third colour was red. While I could substitute the pieces of the blue one, part of me still liked keeping the models separate and for many years (until at the time of writing this) inside their tubes. To begin with, I just collected the Bohrok and a few little models here and there. The sort of little packs which went for £5 or less. Eventually though, I did buy my first hero figure, that of the blue, axe wielding Gali Nuva. I liked the fact the character carried an Axe, it was different and the picture on the box looked Awesome. After that I got the green, sword wielding Lewa Nuva. Like before however, I did not collect all the right sets to build the full large one. 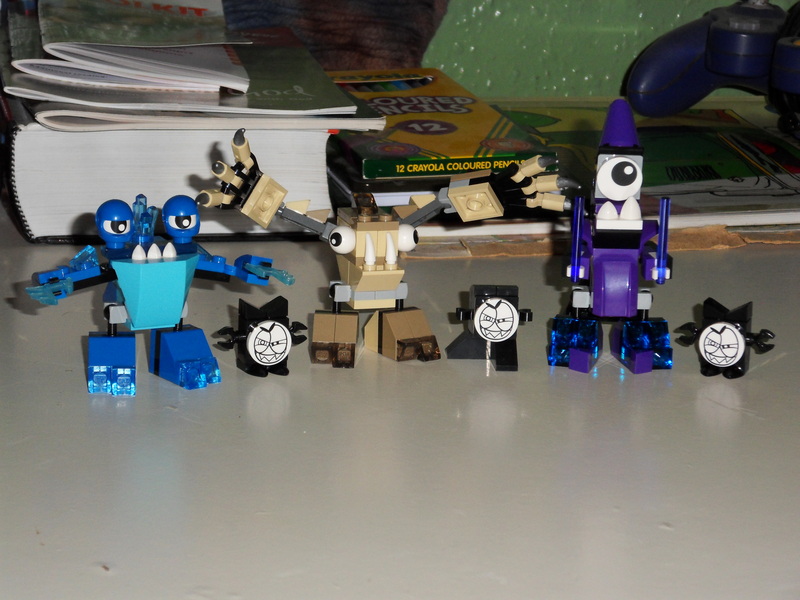 In this case it was Kopaka Nuva I needed to complete the set and make the bigger version. But in the end I only bought the blue and green one and then, a whole new set of Bionicle was released and I was unable to buy it. 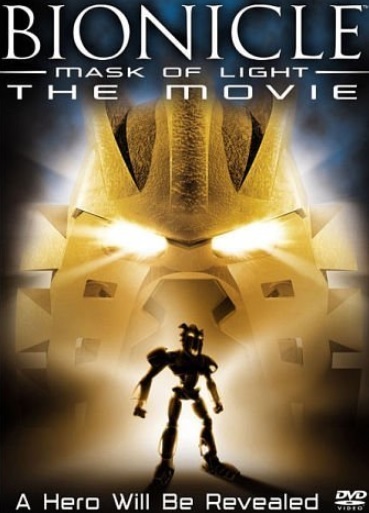 As my enjoyment of Bionicle continued, I also became interested in two things announced for the franchise. One was the video game for the GameCube, which I did not play in the end; and the direct to video Bionicle Movie, which I did see. I remember waiting and waiting for it, and then going to Blockbuster (remember them?) the day it was released to see that it was not there. My Dad very kindly bought it for me though and so I watched it the following day after school; and really enjoyed it. I watched it again the following Christmas too. The film used CGI and gave the characters voices, one of which sounded like Wolverine from X-Men Evolution, but the story was still pretty interesting. Eventually though, my interest began to wane, around about the time the sets appeared to change completely, it was like the old stories and characters had just disappeared. For me, I began to get more interested in other things. 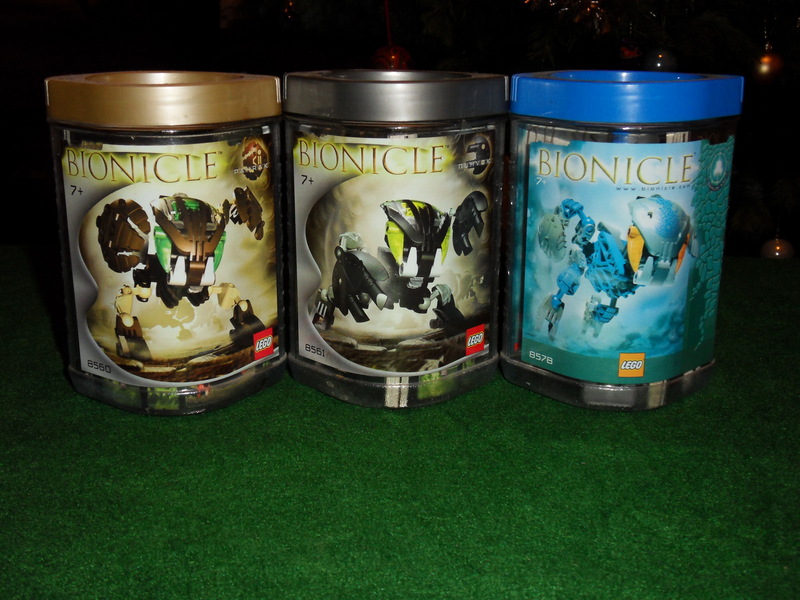 But every now and then, I would look at Bionicle to see what was happening with it. 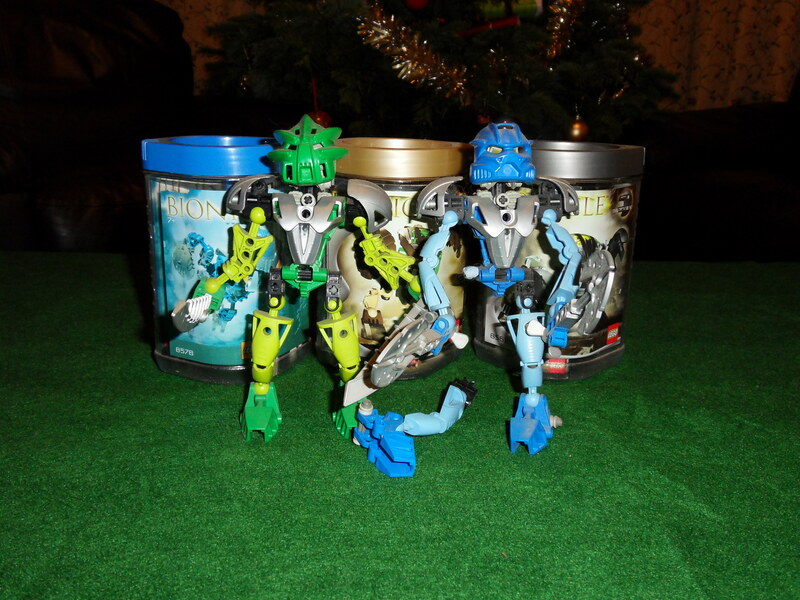 To this day I still have my collected sets including the Bohrok and main action figures, although Gali Nuva has lost the ability of their right leg as the joint at the hip is broken. A couple of years ago I did begin to plan an idea for a single frame comedy series using my Bionicle sets as the main characters and have a possible story arch. The stories though would revolve around one of them being serious, and the other not so serious and a bit daft. I didn’t get round to doing them though. Then back in 2011, 2012, after receiving some money from my Granddad, I decided, instead of using the money on DVDs or Videogames, I decided to spend it on some Lego. I hadn’t bought any Lego in years, and kind of really wanted some. The first thing I looked up was Bionicle, which I discovered, almost to my horror, but not quite horror, that the sets had been discontinued. I was quite sad at this. The idea that Bionicle had been stopped being produced. I had so much fun in the past with them. The news was close to heart-breaking. I did discover that the series had been replaced though with Lego Hero Factory, which didn’t look as good as Bionicle, but I bought a character from this set, and a Lego flatbed with excavator set, all part of the Lego City range. Since then though I have become interested in a new Lego series; Lego Mixels. I first spotted them on a day out with a friend, and liked the fact that the individual sets only cost £3. So I bought a set, then the following week another, and then when in the paying queue at Argos, I bought another. The sets work a lot like Bionicle in the idea that certain sets can join together to create larger models. At the moment though I have three sets, each a different colour. For me though I like the amount of excitement they bring. It may only be three pounds worth of Lego, but it gives me a lot of enjoyment. When I went to see The Lego Movie in April, I noticed there was a brief mention of Bionicle, but I thought it wasn’t enough. It was one of Lego’s bestselling toys during its production, and as such it should have had more of a part. But this sighting made me wonder. A few months ago while looking online I heard rumours of a possible return of Bionicle, but no concrete details were available at the time. Then last week, I looked it up, and was directed to the Lego Website, an official page for a new Lego Bionicle series. First I was sort of sceptical, but excited enough to do some further research. I looked on Amazon to no luck, but then I looked on Wikipedia, and discovered that Bionicle is indeed being re-launched in 2015. I was really happy at this news. Further research showed that the sets will be combine-able too, so maybe I might complete a set at long last. While I have yet to discover an actual release date for the sets, I am really excited by this news and am looking forward to seeing what the new series looks like. While it has been a few years since Bionicle has been seen, from first impressions of the new sets, I am really excited to the new releases and simply the announcement that the franchise is set to make a comeback, has got me pumped up and ready for the day it finally gets released. Lego Bionicle has returned. GENEPOOL (Let’s hope Lego bring back the Bohrok too). 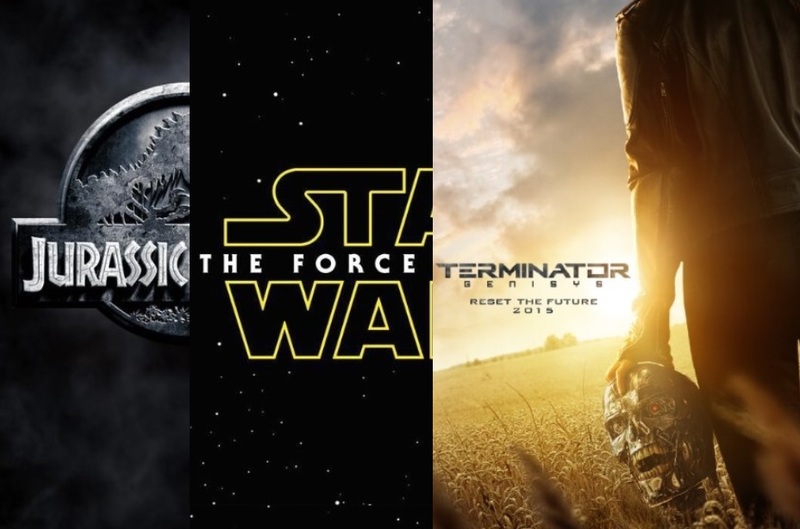 A couple of weeks ago, two of Cinema’s big blockbuster heavyweights released trailers for their long-awaited return to the big screen. Now while I wanted to do a comparison or look at the trailers type post for both Jurassic World and Star Wars Episode VII, I didn’t quite get round to it, but after the release of the Terminator Genisys trailer this past week, I decided to do it, and combine all three. First off was the trailer for the new Jurassic Park film, Jurassic World. It has been over 13 years since a Jurassic Park film has come out, and while there have been a couple of re-releases of the original film, it has been quite a while since a new film has been made. Jurassic Park, originally based on the book of the same name by author Michael Crichton has had 3 films so far. A fourth has been in the works for a number of years now but finally it appears that there is light on the horizon. Next up was Star Wars Episode 7 (or VII if you want to be specific). Once again, it has been a while since a new film has been released; the last one being in 2005 (if you don’t include Episode II.V which was more an animated film, not a live action film). In 2012 when Lucasfilm was bought by Disney, Disney announced that a string of new Star Wars films were to be produced with Star Wars: The Force Awakens to be the next film in the series. Finally, there is the next film in the Terminator series. The last time the Terminator was on the Big Screen was in Terminator Salvation in 2009. While the previous 3 films in the series looked at the events leading up to the war against the machines, Salvation finally set itself in that war. Well after 5 years, Terminator is back (no pun intended). So, let’s now look at these trailers. I thought, for a bit of fun I would organise them in a similar manner to how I do my Top 5 posts. So I’ll put what I think is the best looking last, and build up to it, with third first and second…..second. When Disney first made the purchase and the announcement was made about new films, I was undecided. First it sounded like an interesting idea, but I had this feeling that Disney was just going to end up milking the franchise for all it’s worth. Even when J.J. Abrams was announced as the Director, while a little alleviated I was still unsure. The problem I had been them referencing the original films over and over again. Not do anything new, just re-do old storylines and characters. No new story, or characters or items. Just old stuff 24/7. So eventually I just put it to the back of my mind, not really thought about it, just mildly forgot and take an interest every now and then. Well, the new trailer was released, and I was right. The trailer begins with a scene that looks like Tatooine, not a new planet, an old favourite. It shows images of Storm Troopers, X-Wings and the Millennium Falcon. Like I said nothing much new. Yes, there are new cast members and a new robot. The villain that appears is one ‘supposedly new’ thing that I do like. The lightsaber is more orangey than red, and the flaming handles are a nice touch. I mean the trailer isn’t all that bad, but given the prequels are set something like 30-40 years before the main trilogy, I’d thought that 30 years after the events of the original trilogy that there would be new bits and bobs, not old stuff. The trailer isn’t that bad, the little robot looks kind of funny, and the shots of Storm Troopers and X-Wings do look interesting. But I still think that Disney are relying too much on the previous films. It’s like the Marvel Cinematic Universe is right now, the way that they are constantly reminding the audience of The Avengers movie, instead of allowing the standalone films like Thor and Iron Man the opportunity to stand on their own two feet. While it does look pretty exciting and has raised my expectations a little more, the thing is, it’s still just a teaser, when a main trailer gets released, we should be able to see more. While I am still unsure about this new film, the trailer has made me a little (just a little) bit more excited about it, and it’s mostly due to the flaming lightsaber. Next up, it’s Terminator. I really liked Salvation, I liked the cast, Sam Worthington and Moon Bloodgood were both really enjoyable to watch and I liked the setting and premise. The original films originally didn’t really work for me. I have not seen the first one; I have seen the other two. I originally didn’t like number 2 but more recently I have grown quite fond of it. A new Terminator film is always exciting and I have followed (on and off) the production of 5 for a while. I was hoping for another film set in the future during the war. Possibly more like the war shown at the beginning of judgement day with lasers than the bullet filled world of Salvation, but the chance for a Salvation sequel was always on my mind. This new trailer however, is quite different. The trailer does show the future war against the machines, with battle sequences and terminators, but it also travels in the past with the character of Kyle Reese being sent back in time to when Connor was just a child and is being raised by a Terminator. It looks like instead of doing either or, it is doing both, showing the war and the past. The initial trailer cast looks pretty good and the setting and action scenes look pretty exciting, however I get this feeling that the film looks a bit like Twilight, like it’s designed for that market and audience. While the costumes are definitely more like Kate Beckinsale in Underworld, the cast together look like they were filming another Twilight film, this time with robots in it. It’s just the cast and the light uses and points where they are together look like the twilight trailers, and the posters, same goes for Genisys’s posters, it looks like Twilight. While I still have my little worries about it, I am really excited about this new film in the series, it looks brilliant. Finally, it comes round to Jurassic Park. I have been following the production on Jurassic Park 4 very closely for a number of years now. When the film finally went into production I was pleased, I have been wanting to see a new Jurassic Park film more than a new Star Wars film. Recently I read the book by Michael Crichton and really enjoyed that too. So when the trailer came out, I was so excited to just see it. Firstly, it should be noted that this is not a remake or reboot, it is a sequel and it is set about 22 years after the events of the first film. The new trailer shows a lot, and it shows a fully working safari park for dinosaurs. The trailer also shows dinosaurs, in particular a brilliant shot of Liopleurodon/Predator X depending on what the producers are classing it as. The trailer also reveals plot elements and reveals the idea of a hybrid dinosaur. Now while I am a bit worried at the sound of that, the trailer does not show the creature and so no spoilers are given. The idea of the park working and accepting visitors is brilliant, but the inclusion of the genetics which the book and first film explore combined with the working park make it look like the park (when finished) represented in Crichton’s original story. The inclusion of the hybrid also brings a level of mystery and jeopardy to the trailer which makes you want to long for more. The effects look brilliant, and the dinosaurs as well as the human cast look great too. While it may still be a few months away from being released, Jurassic World looks Fantastic. After the critical and box-office success of the Legendary Pictures Godzilla film, a sequel was green lit. With the director busy with his own Star Wars film, the production of the sequel is currently small at best while they wait for the director to return. So, the sequel, instead of being released in a couple of years, is going to be released in 2014; almost 4 years away from now, similar amount of time from Legendary acquiring the rights, to the film being released. But between now and then there are a string of films to entertain us until the King of the Monsters returns. But, it was announced just yesterday that Toho, the original home of Godzilla, have announced that they are making a new Godzilla film, the first to be made in Japan for 10 years now with a projected release of 2016. 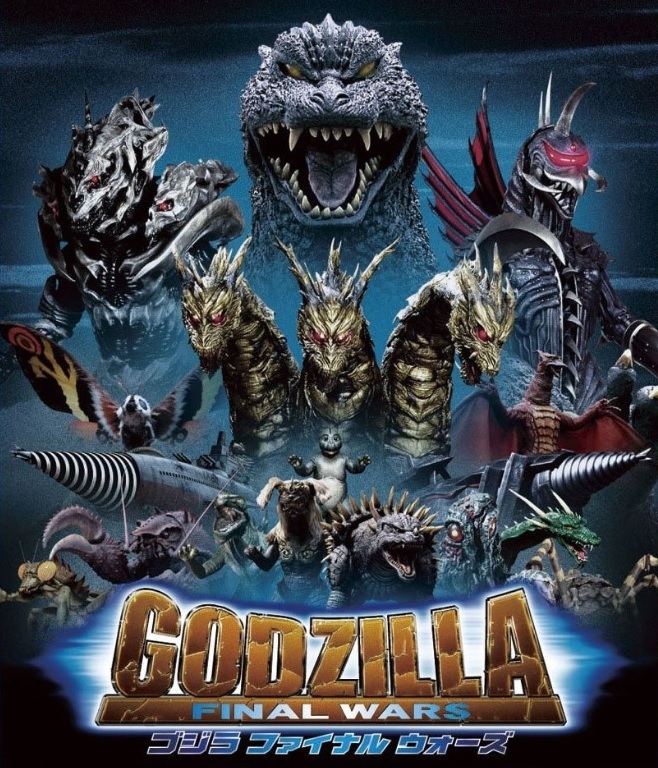 Back in 2004, at the time of the release of the 50th Anniversary film; Godzilla: Final Wars, Toho announced that they were going to put Godzilla on a 10 year break in the hope of gaining renewed interest in the series. 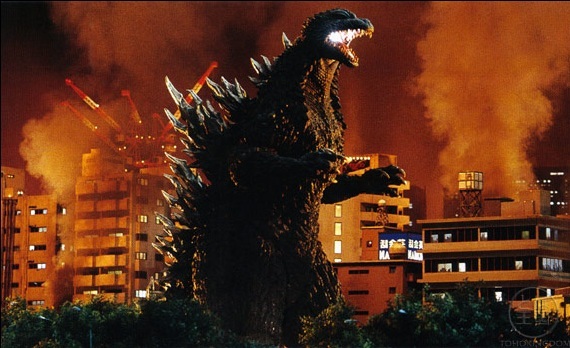 Now while it was originally thought that they would produce a possible new film in 2014 for the 6oth Anniversary of the series, due to the Legendary project gaining steam and heading for a 2014 collision, it appeared Toho decided to let the new 2014 film to have it’s moment in the spotlight and see what the reaction to it was. The reaction to the new film has been very positive, it grossed over $500 Million at the box office, and with it being the end of the film season, the film has been listed in many sites, top films of the year lists. This announcement though that Toho has decided to bring back the Monster to it’s home turf comes as a bit of a surprise. 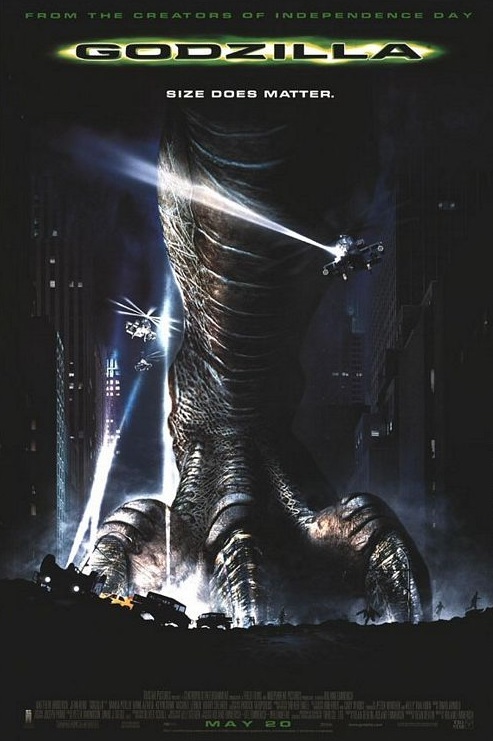 Back when the 1998 film was released, and the reception was non-too-pleasing, Japan decided to revive the big lizard for a 1999 film release, Godzilla 2000. When I first read the news that Toho had decided to bring back Godzilla for Japanese cinema’s in 2016, I couldn’t help but wonder if the same thing was happening here. However, that does not appear to be the case. The Legendary film is still going to get a sequel, and Toho have announced that their new Godzilla film won’t be any relation to it but will be an entirely new film to the franchise. The decision to bring Godzilla back to Japanese Audiences, is due to heightened fan support following the critical and positive reception to the Gareth Edwards film. 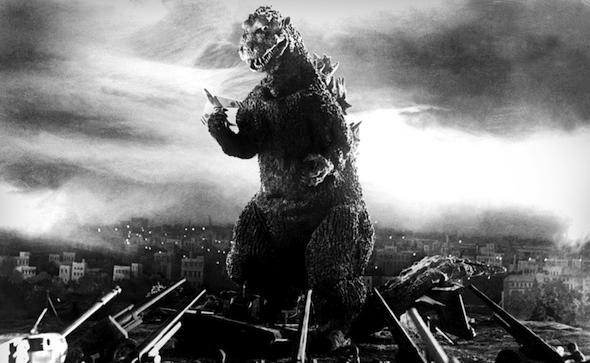 Toho said that “The time has come to make a film that will not bow down to the Hollywood film”, supposedly meaning that they want to produce an even more powerful Godzilla that could beat the 2014 monster in a fight; I mean they’ve done it before……….and won. Toho have started a Godzilla Conference (“Godzi-con”) to discuss and think of how best to proceed with a strategy of producing future Godzilla related productions. Production on the new film is stated to begin in mid-late 2015 (about the same time that Pacific Rim 2 is supposedly going to start filming) with a release in 2016 (same time that Godzilla 2 should be entering production). A director has yet to be announced but the project is currently being helmed by producer Taichi Ueda. Whether or not this film is going to receive a limited international release or not has yet to be announced, but I am hopeful. While it still comes as a surprise that Toho are proceeding with a new film despite another series is currently going ahead, it is rather exciting news, and if it comes to full fruition, and if it gets more of an international release, it will mean that we won’t have to wait 4 years to see another Godzilla film. GENEPOOL (Please check out my review of the 2014 film).